The crowd of over 6000 people were in concert when they described this year’s exhibition as the best in the life of the event …. a stunning display of works, 33 in total. And to have 16 of the works sell is fantastic for the artists and the public. This a selection of the works with my interpretation of their story. This is my entry into SBB – Roll out the Barrel. A song that I remember my father and many others bursting out with when he tried his hands on the piano, something he had a natural gift at. The negative space signifies the age of the song, something in the past, …. tends to enable the viewer to imagine, dream, how was it all then. Jarrah and copper blend well together. I like to do the exaggerated muscle definition on figures. Enjoyed doing this piece. Only the Ocean (Dale Bentley – Charlie Chop). Inspired by Mick Fanning’s battle with the shark. The scale is spot on, and the posture imposing and positive. I love the position in the landscape and the way the light bounces through the torso. The construction looks light but strong and balanced. Excellent piece that should grace a point overlooking a surf break. Two pieces … Dingo by the Bay and Free.Dingo is by Chris Latham is a very effective statement that dingos used to wander these parts of the south-west and now have been forced into the arid areas by urbanisation etc. The dingo has arid colours on the inland side and ocean colours the other. I can envisage it in a sculpture park. Free (Christian Farrell) on the ocean is what people envisage happening on holidays in places as Dunsborough …. relaxing, blissful, getting away, lost. Tidal Totems (Merle Davis) – a colourful, interactive (Jenny Clark and Chris Latham), engaging work made from abandoned synthetic fishing rope, nets, plastics and floats salvaged from the ocean. Left in the ocean it tangles with the environment to cause death and disaster. 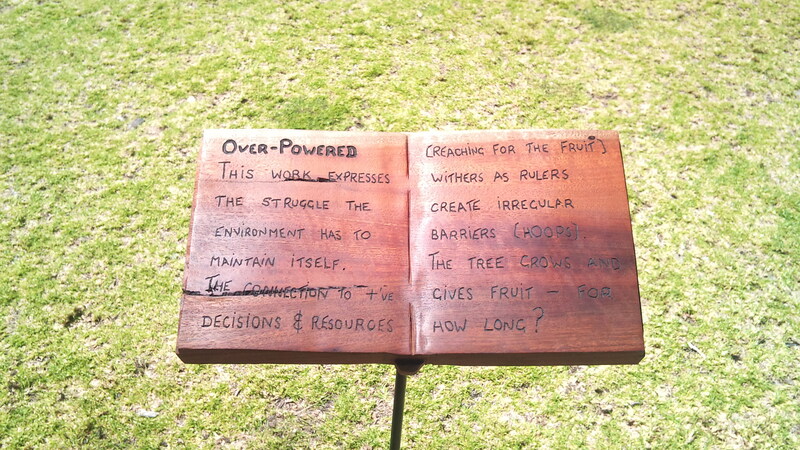 A Succulent Piece of Fish (Scott Michell) – a joyful play on words, and a magnificent garden piece. I know it is now positioned in a front garden at Yallingup and will continue to grow in itself and on the owners. A lovely ornament. Alma (Deborah Campbell). A skirt made from pressed tin is very effective to tell the story of pioneer women, and a fabulous way of recycling what was someones ceiling or wall. From all directions this piece has shape and style. Woven Reflections (Emma Headley). Looking initially at this piece you don’t see that the main component is aluminium soft drink cans cut into strips. The colours achieved and the reflection on the mirror, plus the square sections of aviary wire, has the mind conjuring up a range of images from freeways to high rise metropolis. I’m a fan! Return to Gaia (Daniel Fisher). Evokes a lot of emotions …. Avatar, searching for a life, treading carefully, despair, reaching out. I can imagine this was a very emotional piece to make. The spoons are very effective as leaves. Cocoon (Sue Smorthwaite), felted wool. It would be fascinating to put this work into a public art environment to see how nature would interact with it ….. and how it would interact with nature, would it keep it’s colour, shape? A medium not often considered for public art, but perhaps we should! Bush Buddies go to the Beach (Lily Mercer), stoneware ceramics. This is Edwina the emu, a joyful interacting work that can go indoors or in the garden. Once you meet Lily one realises where the character of her pieces come from, bubbly, vivacious, smiling, out there. 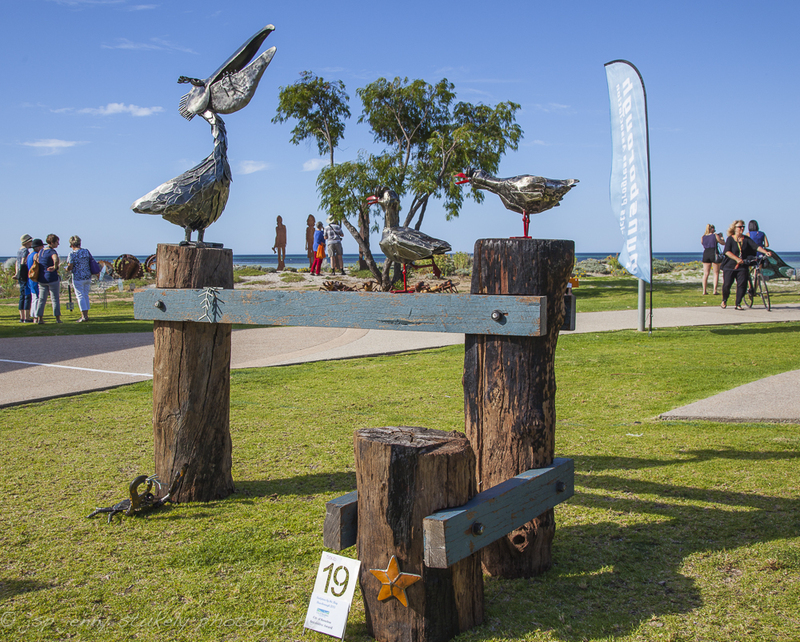 These are but a few of the works that were exhibited at this years Sculpture By The Bay, Dunsborough, Western Australia, Australia. For all photos of the exhibits look at facebook Sculpture by the Bay. The sixth Sculpture By The Bay (SBB) beat all expectations, certainly in terms of quality, visitation and sales, but also the impact and depth of message. As an example, Tony Davis exhibited 303 Poppies. He was inspired by a horse he saw in a field of poppies in Western France. It looked so much like photos he had seen of Australia’s Whalers. 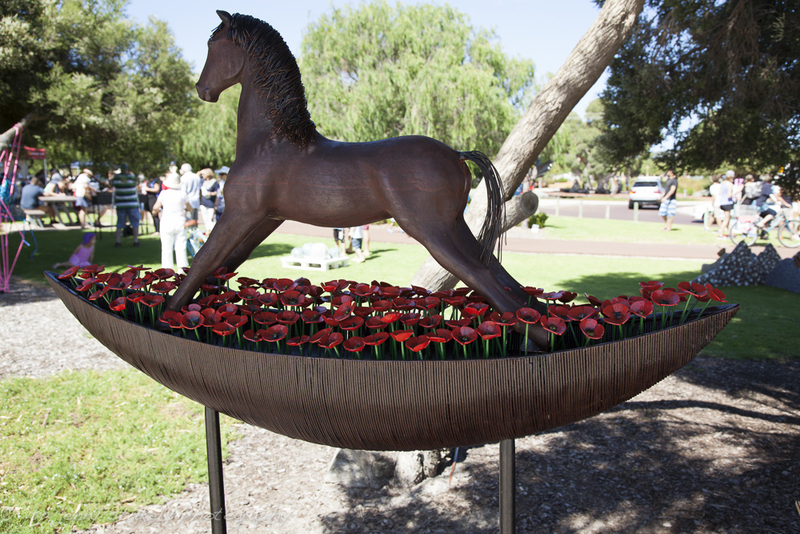 The message ….. could this have been a descendant of the 120,000 Aussie horses sent overseas in the 1st World War, never to return? It is a wonderful piece of work that reminds us of so many stories around that era. 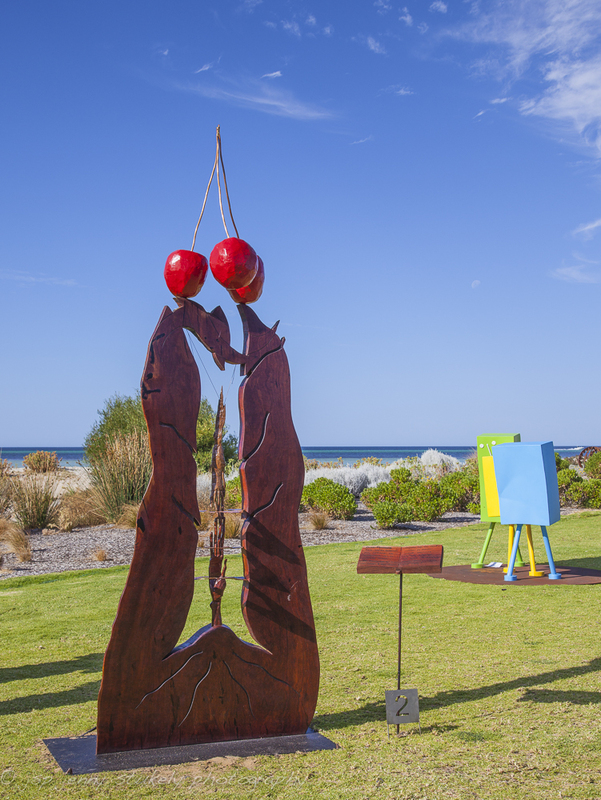 To give a little background to SBB, Nita Pratt and The Dunsborough Progress Association initiated this event, to be held annually during the Labor Day long weekend (usually in March), to promote Public Art and encourage creativity within the local community. This year there were 31 exhibitors of which more than 50% were from the Busselton shire. This year over 2500 people voted in The People’s Choice award. This possibly means that over 4000 people viewed the exhibition. At least 18 of the works will installed in different places throughout the State. These photos are a few of the 31. Photographer for SBB, Jenny Stukely, has taken these photos. The words around them are my interpretation. Industrial Planet, by Justin Webb, is built from used (long ago) agricultural parts, combined into a ball that expresses the interconnectedness of all that in agriculture. I can see parts in there that remind me of a past occupation, names and stamps on steel that are still current but are found on new technology, spanners that no longer exist and pieces that have become redundant. If this was in my garden I could stand looking at it for hours seeing old stories. 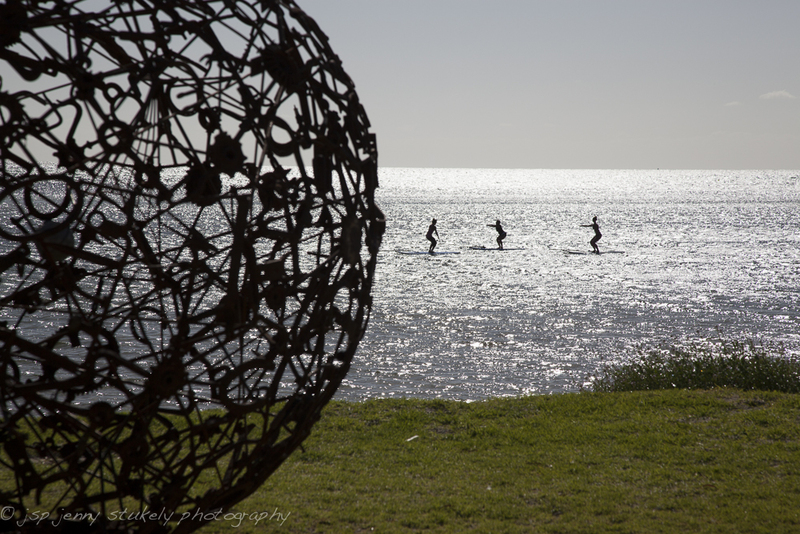 in this photo Jenny has captured 3 people on SUPs doing yoga, a wonderful combination of old stories and tranquillity. OverPowered, by mois, is all about evolution of the environment and the belief we need to maintain its health at least at the current level. I found this timber slab from a tree that had fallen over in a storm. It was an old tree, possibly about to stop living anyway, but it had produced flowers and seed the year before it had blown over. Since the storm new trees had sprouted from the seed, then a tractor came in and cleared all of the area. That piece of the environment had not been allowed to evolve. So, this piece became my monument to that piece of the environment. The ‘hands touching’ is the environment reaching out through the many irregular barriers (re the beaten copper hoops) to access and nurture the fruit that it has produced. But the connection to the rulers to allow the continuity of the environment is withering (the top arm is becoming disconnected) – so how long will the cherries exist? how long will the environment continue to give fruit and maintain a level of health if the rulers (government and religions) don’t have an ongoing unconditional unanimous commitment? Nuts about You, by Voytek Kozlowski, is a story about Dunsborough. The red-tailed black cockatoo continually chatter and eat the honky nuts in the marri trees, drop them on houses with a clang-clang, on the roads and back into the forest. They are a beautiful bird, noisy in the air and joyful in their conversation in the trees. Good colours, style, lines and a solid resilient work, this piece has been awarded The Dianne Laurance Wine Award for best sculpture at the exhibition. The final piece I am writing about is Whine & Dine, by James Horsely. Once again, great photos Jen! 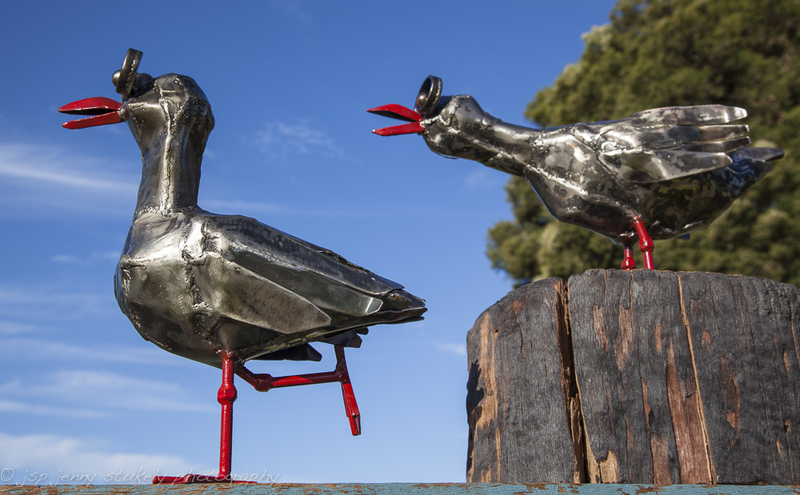 James work is a joyful piece of the darker side of nature, the cut throat way that ocean life is … ‘winner take all’ … the Pelican that has the spoils of the ocean in the mouth, the seagulls waiting for the spoils, and the crab the ‘bottom feeder’. Colourful and natural, it reminds me of the stories that Josh Whiteland from Koomal Dreaming tells about the bay, the pelicans, the old fish traps and how it all existed before colonial takeover. The pelican’s pose is ‘classic pelican’, beak angled up like it’s trying to swallow the last morsel, but in a superior jocular way. The seagull on the post has that stretched forward stance squeaking out ‘give me some’, and the other just ready to pounce. 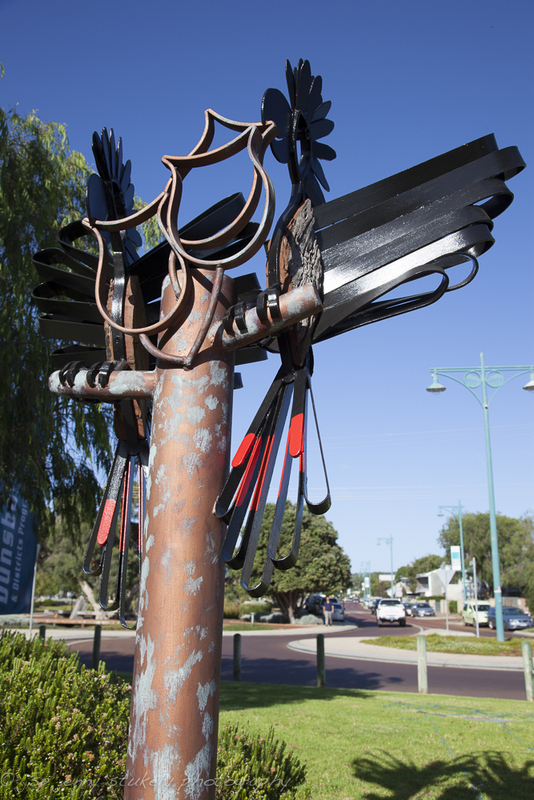 This work has been acquired by The City of Busselton to be placed within the Dunsborough community for their enjoyment.